A seared, crunchy-skinned Branzino filet atop miso-marinated portobello mushrooms at Lucille's in Houston's Museum District. I had not been back to Lucille’s at 5512 LaBranch in midtown Houston since it opened four years ago. This was for a few reasons. My off-putting introduction was what I’ll always think of as the “loaves and fishes” media luncheon. There were seven food writers in attendance. At some point, a single plate of shrimp and grits sailed out. There were five shrimp to split among seven people. I think poor Hank On Food missed out completely. The cap on my decision was not Katharine Shilcutt’s negative review of Lucille’s when she was still at the Houston Press, but chef Chris Williams’ bitter, accusatory response to it (which may be gone forever as last year’s revamp of the web site eliminated all the old comments). At that point, I assumed that Lucille’s had no use for Houston’s food media or feedback. It is situations like these that recently led me to start hosting “Dealing With The Media” seminars for food and beverage professionals. How to interact with or react to reporters shouldn’t be a mystery. Last year, I finally tried to visit Lucille’s again, and my luck is so bad that there was a private party going on that night. I filed it away in my “places to go soon” list. As fate would have it, I received an invitation to return a few weeks ago, and I did, hoping very much to find a revitalized restaurant that would excite me with its offerings. Lucille’s may look the same as when it opened, but what I found was a chef with a reinvigorated point of view and a mature restaurant fulfilling the potential that has always been there. Recent international travel gave Williams new inspiration and it shows in the international flair he’s now integrating in his recipes. First off, the cocktails: putting quality ingredients in a glass is only half of the equation. 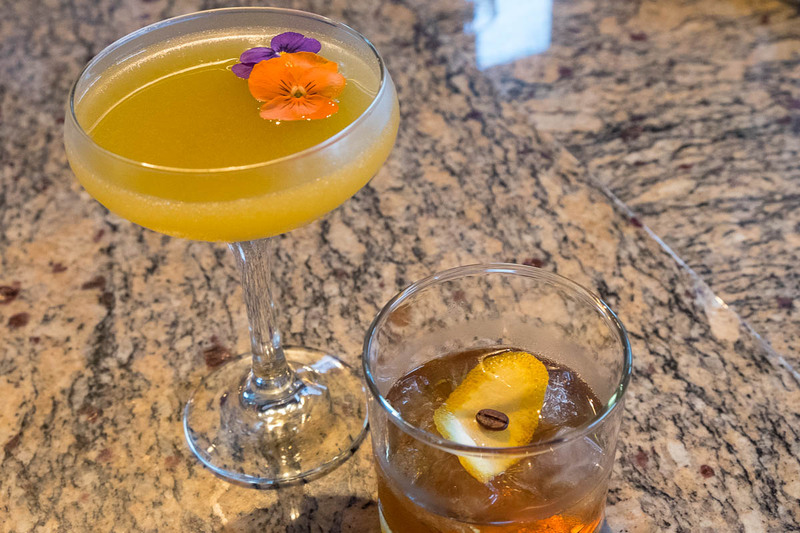 The difference between a good cocktail and an exemplary one is whether the technical execution is correct. Is it strained? Are there ice chips? Did it sit in the shaker too long and get watered down? Each cocktail we tried, from the juicy, vibrant He Loves Me Not (gin, Dominican vanilla (vanilla quisqueya), crème de violette, turmeric and mayhaw citrus preserves) to the chocolaty, sultry The Aftershift (Bulleit Bourbon, Cinzano Rosso vermouth, turbinado syrup, Fee Brothers Aztec chocolate and orange bitters) was balanced, appropriately garnished and free of the telltale ice chips that indicate improper straining. He Loves Me Not is great to start with; I’d have The Aftershift with dessert next time—or alone. If you appreciate a short and well-curated wine list, you’ll love Lucille’s. It manages to be a diverse selection from small vineyards without being overwhelming. It’s quality stuff, too, as it’s being sourced from local retailer French Country Wines. Williams used to work at Max’s Wine Dive, so he knows what works with his food. Some examples include Le Petit Caboche Sauvignon Blanc from the Rhone Valley, Bodegas Epifanio Tempranillo from Spain and Route Stock Pinot Noir from Willamette Valley. For small bites, Lucille’s still serves its two-bite sized chili biscuits in honor of Williams’ grandmother and the restaurant’s namesake, Lucille Bishop Smith, a culinary pioneer who created the first hot roll mix in the United States. 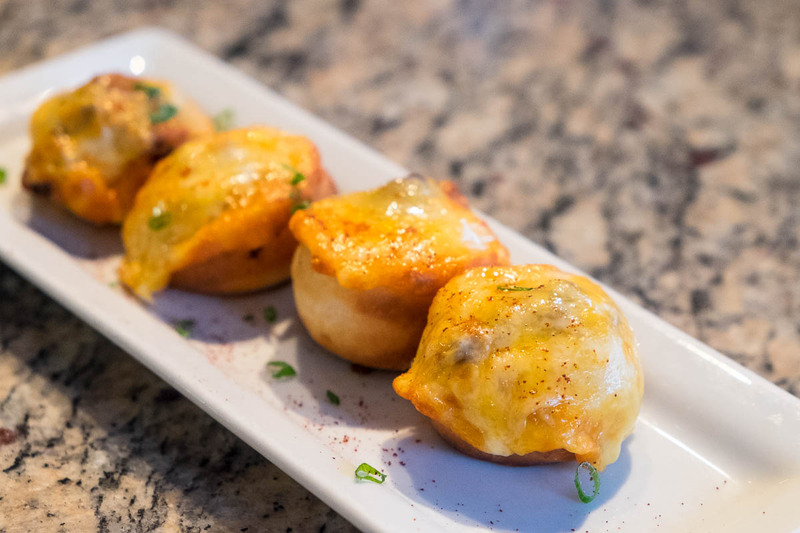 The chili biscuits were her signature dish and are just as they sound: little biscuits filled with chili and capped off with melted cheddar. Despite the small size, two per person is just the right quantity to kick off a meal. Williams said he had to work a long time to correctly replicate the original recipe. Besides that, as good as those little gems are, it’s important to leave plenty of room to taste through more of Williams’ menu. 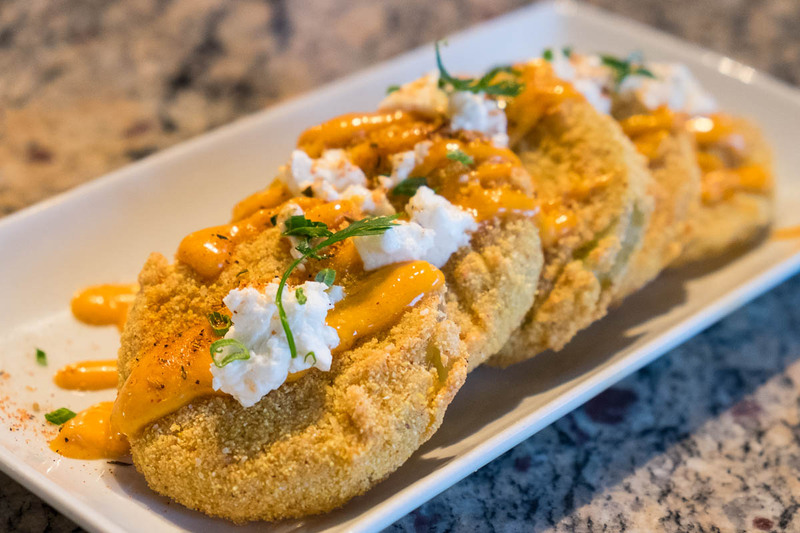 Fried green tomatoes ($8) are another holdover from the original menu, and for good reason: they’re excellent. The cornmeal crust is just right; not too tough but with enough staying power to envelope the slices completely. These are garnished with cloud-like dabs of goat cheese and spicy aioli. 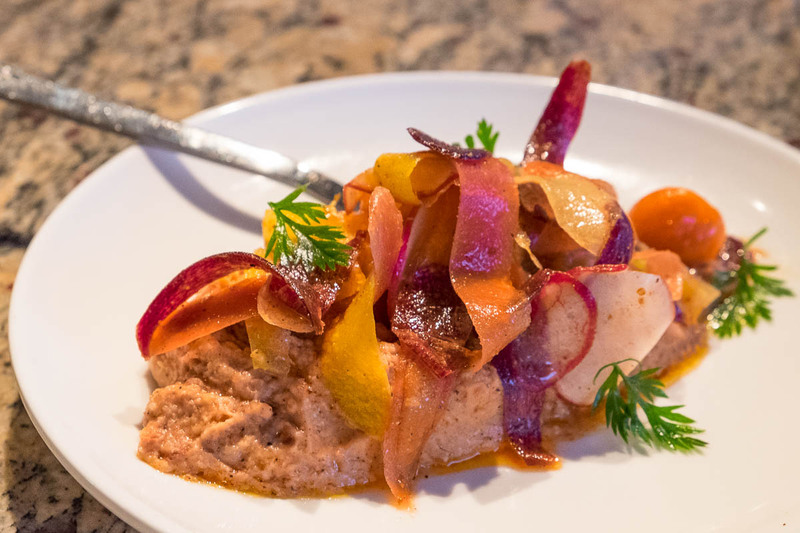 I found it disconcerting that the Southern Hummus & Roots (aka black-eyed pea hummus topped with shaved baby heirloom carrots, radishes and tomatoes; cost is $9) was served with no bread whatsoever. On the other hand, that makes it a carb-avoiders dream. The bright veggie ribbons are dressed in cumin and lime vinaigrette, which lends intriguing smoky tang. There’s sumac as well, a tart seasoning made from dried berries that Williams says is used often in the Balkans. Once we were over the bread issue, we scooped it up by the spoonful with abandon. A trip to Saigon led Williams to develop another new dish. His Saigon Shrimp ($12) features hefty, shell-on specimens from the Gulf that are marinated in oyster sauce and sambal for 24 hours. After the soak, these are char grilled until they blackened and crisp. 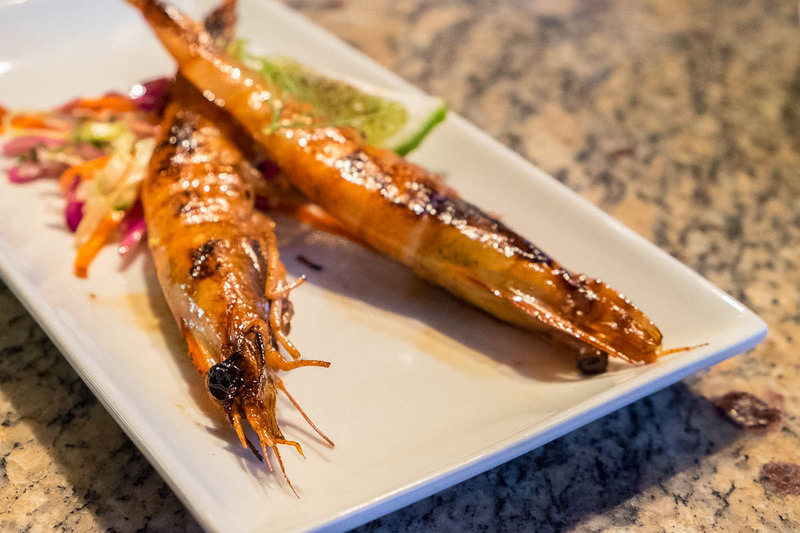 Served on skewers, the entire shrimp can be eaten, shell and all. It’s served over citrus and cilantro slaw with a punchy nước mắm (prepared fish sauce) vinaigrette. 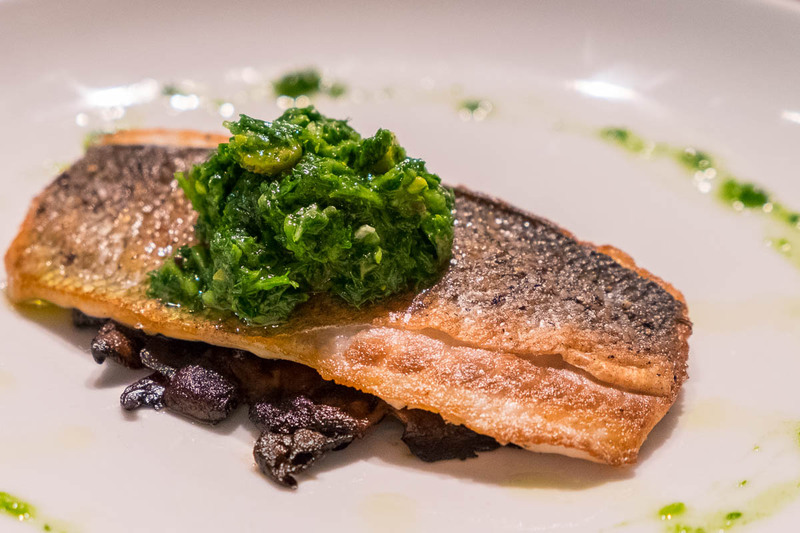 Branzino, or European seabass, has made appearances on many Houston menus. Few are as well-executed as Williams’ version, which was the market priced fish of the day. He says he learned the technique during an impromptu throwdown with a Croatian chef. The fat layer of the skin is so well rendered that it becomes a crisp treat unto itself, but that is not to say anyone should ignore the tender flesh underneath. The filet is topped with a goodly amount of pistachio and dandelion green pistou (the Provençal sibling of pesto) and underneath are William’s innovative miso-marinated Portobello mushrooms. He uses that same miso marinade with his sorghum-brined quail ($29), and it is hard to say which is more spectacular: that or the collard green kimchi that comes alongside. Williams makes that kimchi himself. It ferments in glass vessels for a week, and then the tangy, spicy goodness is ready. 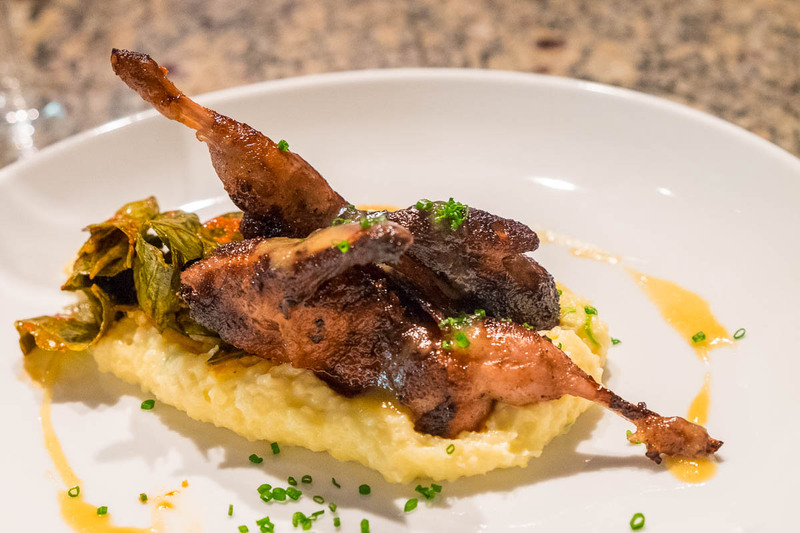 It’s served with the quail on top of grits tinged with sorghum and cheddar. As disparate as that all sounds, it all works together in impressive fashion. The only dish that I didn’t like was the bone marrow. It’s a big, generous bone, too, but the heap of oxtail marmalade that comes on top was just overpowering. I joked to Williams that it is the “bone marrow that eats like a meal.” It’s just that I really enjoy good bone marrow with minimal accouterments. A little salt, some bread and something alongside to provide tang, like pickled onions, is all I need. Perhaps you, unlike me, haven’t had a four-year gap between visits to Lucille’s. In that case, maybe you’re not as surprised as I am as to what is coming out of Lucille’s kitchen. Either way, I think we can agree that a fresh visit to see what Williams has been up to lately is best made sooner rather than later.